In dengue virus infected mosquito's, the virus is present in the salivary glands of the mosquito. When a female Aedes aegypti bites a human for food, she injects saliva into the wound where the anti-coagulants contained in her saliva facilitate feeding. 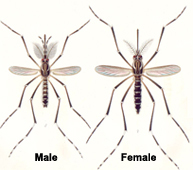 Without knowing, the mosquito also injects the dengue virus into the host. 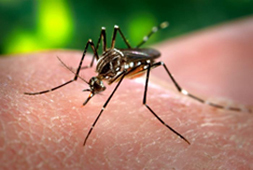 Since the virus can be passed from adult to egg, the dengue virus is guaranteed to survive until the next summer and heavy rains.